The theme image for Sepia Saturday 273 features a couple of Edwardian ladies riding their bicycles through Battersea Park in London. My best efforts at a match involves half the ladies, half the bikes and a park of unknown origins. The photograph itself comes from the ubiquitous suitcase of old family photographs and measures just three inches by two. But so much life, so many memories, so much history is distilled into that small space, it has a rare and fine distinction – a vintage single malt whisky of a photograph. The photograph features my mother, Gladys Burnett, and must have been taken in the early to mid 1930s. 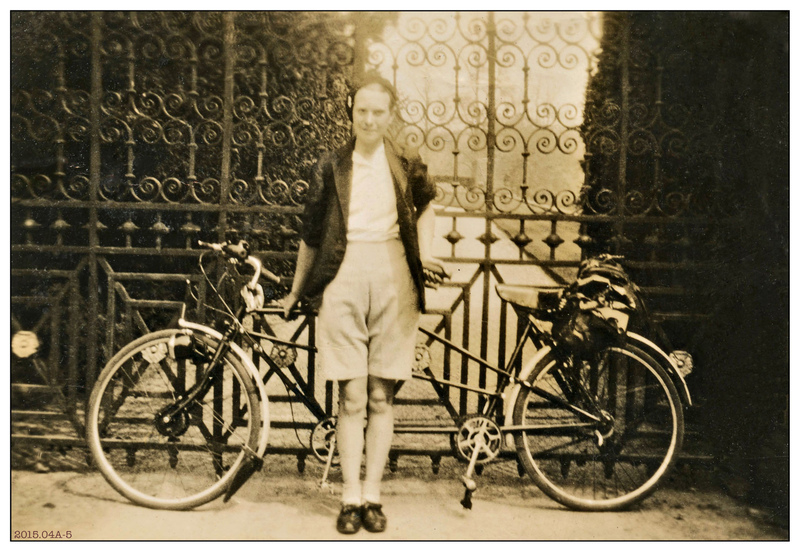 At the time my father and mother had a tandem and their holidays would involve tours around Britain. Later my father graduated to a motorbike and sidecar, a graduation my mother welcomed because – given that the predominant climatic conditions were wet and the predominant topography was hilly – she was happier under the protection of a canvas awning and the motive power of an internal combustion engine. Looking at the photograph now – eleven years after my mother died – I can still recognise the smile; a lovely warm rich smile, a Lagavulin smile (lovers of malt whisky will know what I mean).